Blayne Landon (top), Marysville’s 170-pounder, defends a single-leg takedown against Graham’s Eric Thomas. Landon won the match, 6-4. 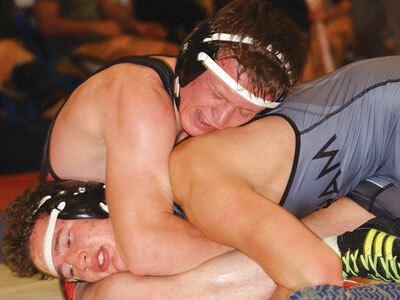 Marysville High School’s varsity wrestling squad split a quartet of matches on Saturday. The Monarchs hosted their annual duals tournament that included a new format where the matches were not based on advancement, yet pre-selected. They defeated Teays Valley, 46-20, and Watkins Memorial, 44-23, and fell to Springboro, 46-19, and Graham, 52-16. The Monarchs started the season with many unknowns because of injuries, graduations and kids who left the program. Added to that unknown list will be the coach of Monarchs next week because they lost their head coach for the next two team points after head coach Shawn Andrews was kicked out of the tournament during the final match for receiving his second flagrant misconduct call of the day. Marysville started the day by beating Watkins Memorial and Teays Valley before falling to Springboro and the Division II defending state champion Graham Falcons. In the final dual, the Falcons got out to a fast start, winning four of the first five matches by pin or tech fall. The Monarchs battled back, winning three of the next four. The Falcons, though, finished the match quickly with three pins and a technical fall before giving up a forfeit. During the third period of the 195-pound match, MHS senior Logan Painter was winning 6-3. He was cited for his second stalling call for backing out of bounds, making the score 6-4. Andrews went to the table to argue the referee’s interpretation of the OHSAA’s stalling criteria. Much like the Olympics, this year as wrestlers go out of bounds the OHSAA has put an emphasis on the referees to either call the wrestler backing out or the one pushing out to encourage wrestling to continue on the edge of the mat. After a lengthy conversation, Andrews argued that Painter was pushed out, but the referee called Andrews for misconduct and took a team point away. As the wrestling continued, Andrews kept arguing his point and reportedly told the referee he was horrible, which prompted the referee to stop the match and called Andrews for another misconduct penalty. That resulted in Andrews being kicked out of the tournament. The penalty also resulted in a second team point being taken away from the Monarchs. According to OHSAA regulations: “In the sport of wrestling, any coach ejected or disqualified for unsporting conduct or flagrant foul shall be ineligible for all wrestling contests for the remainder of that day. In addition, he/she shall be ineligible for all contests at all levels in wrestling until two regular season/tournament contest points or two event days at the same level as the ejection or disqualification have been completed and can’t travel with the team. A second ejection this season would result in a one-year suspension. “My job as a coach is to model composure in adverse or stressful situations,” said Andrews. “That’s what we ask of our wrestlers when they compete. “We tell them to focus on the things they can control and officiating is something you cannot control. -120: Nate Thompson (M) received a forfeit, team score 53-10. -285: Palmer (M) won by forfeit, team score 46-20. -285: Wade Humphrey (S), dec. Palmer (M), 3-2, team score 46-19. -285: Eli Doyle (WM) dec. Palmer (M), 6-5, team score 44-23. “For the number of young wrestlers in our lineup, I was pleased with our first two rounds,” said Andrews. “It was a good start to the season and showed what they are capable of doing. “Our inexperience, however, showed as we got into tougher matches.